It’s 6:00 pm (on any M-F) I begin the trek home from work. 6:00pm isn’t actually the worst time to leave work, if that is what you are thinking. I avoid the 5:00pm rush hour, which often times here in Denver results in one or two car accidents just on Colorado Blvd alone. The entire ride home, usually about 20 minutes, consists of the thought, “what am I going to have for dinner”?…hmmmm. and most days it is the same old, same old, same old boring dish. I boil some water, put in some pasta, let cook, strain the pasta, douse in butter and cover with a few layers of Parmesan cheese. boring? Yesterday, however, was an entirely different day. I did something I don’t usually do, I cooked a delicious meal from scratch in less than one hour total and about $10 for 6 stuffed peppers. BOOYAHHH!!! While sitting at my desk and thinking hard about another way to procrastinate, that is after stalking all my “friends” on Facebook, checking out the latest Groupon and of course playing solitaire until I won, I began looking up recipes online. Now, if you know me well you know Taco Bell and a box of Barilla Pasta are about the closest to cooking as I get, very ethnic I know! 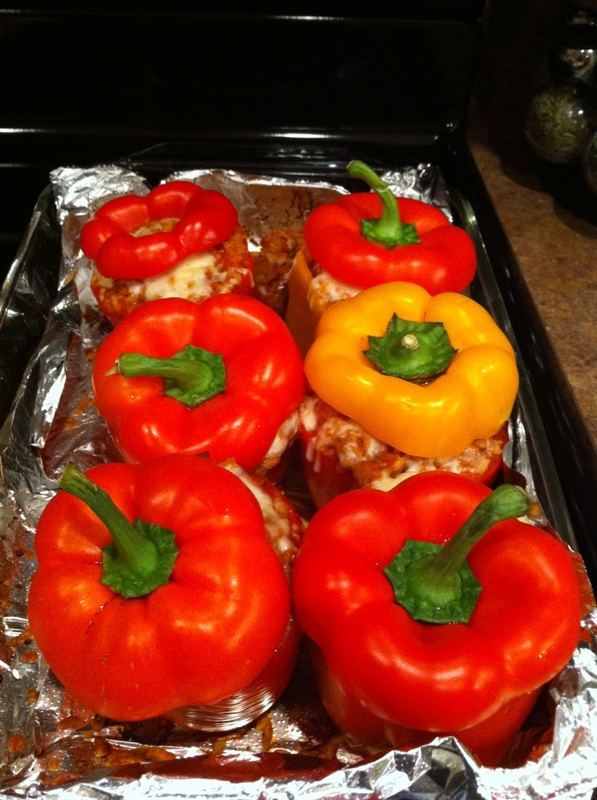 Well, down from the heavens came the idea for stuffed peppers. Have I ever had one? Nope. Have I ever seen one? Nope. Do I even know anyone who has ever talked about them? Nope. 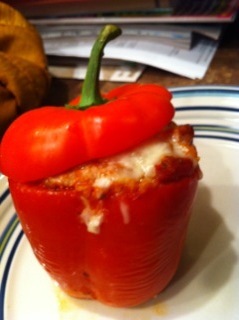 All that aside, I decided yesterday was the day of the stuffed pepper. And after the little bit of grocery shopping and minimal prep/cooking needed, I will most definitely be making those little buggers again. I suggest you follow my instructions below, cook them yourself and tell me what you think! – Bottle of Red Wine ( to drink while prepping/cooking/baking/eating). -add veggies, spices of liking, tomato sauce and rice into the pan with meat and let simmer for a little bit. -when the timer goes off cover those suckers with cheese and take the tin foil cover off, cook for an additional 5 minutes and BOOM! chef boyardee in the house!! pretty nice looking huh? that’s what I thought. Now you go ahead and make them, and love them, and share them with the world.